The Mesa Mission Single vanity combines striking, modern style with a sense of practicality that the Amish are well-known for. Ample space for linens or trinkets comprises the base of the vanity, which also features a delicate leaf detail along the front. Customize your vanity to suit your decor needs with a granite or solid surface top, and rest assured that both are not only beautiful but swipe sparkling clean. You deserve to experience the convenience (and compliments!) 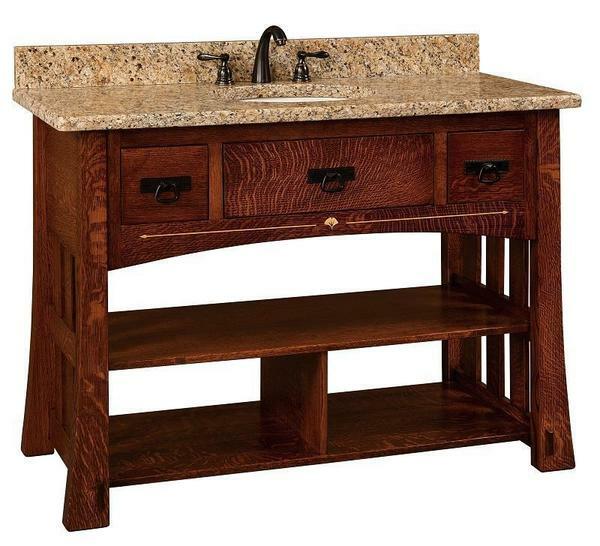 that the Mesa Bathroom Vanity brings into your home. Shop all of our bathroom vanities including the Mesa Mission line at DutchCrafters.com.